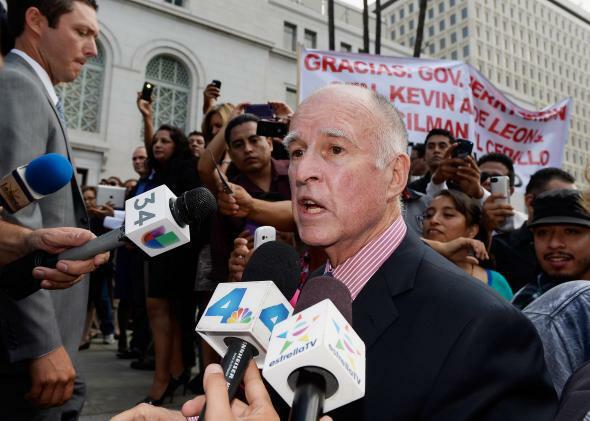 Jerry Brown signs law that allows children more than two legal parents. Conservatives can’t respond. Children in California Can Now Have More Than Two Legal Parents. Conservatives: Your Plan Backfired. This week, Gov. Jerry Brown of California signed a new law allowing children in that state to have three or more legal parents. The instigating factor was a case in which a child was put into foster care after a domestic violence situation between her two mothers landed one in jail and one in the hospital. The child was not legally allowed to go live with her biological father because of the two-parent limit. Gov. Jerry Brown, Californian open-mindedness, and brawling lesbians who are probably bad parents straight out of Mark Regnerus’s dreams: This new law should be causing a conservative media outrage explosion. And yet, the response has been surprisingly muted on the right. Huh. So are conservatives actually OK with this new law? Or are they just stuck? By Dacus’ logic, the ideal number of parents is one, because then there’s no chance for conflict when it comes to child-rearing decisions. But that argument—that more parents mean more problems for the child—directly contradicts the conservative claim that single mothers are ruining the children of America. You can see the problem here. As Hanna Rosin pointed out in Slate when the bill was first drafted, conservative emphasis on the dangers of raising a child by yourself created the context for this law. What the reaction to this law signals may be a sea change in how “the family” is discussed in the public sphere. The long-standing conservative argument that holds that two parents are better than one hasn’t done much to stem the tide of single motherhood, but it has been used to advance important items in the progressive agenda, such as legalizing gay marriage and this new law in California that makes it easier for people to create stability in their non-traditional families. Maybe conservatives have been relatively quiet on this new law because they are brainstorming a different strategy to argue against any family that isn’t the male-led nuclear one of their dreams. Or maybe they have nowhere else to go but to come around.